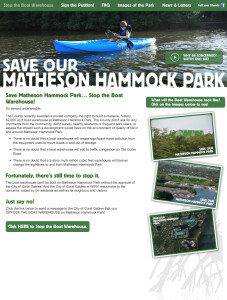 Raise awareness and gather community support to thwart Miami-Dade County’s plans to construct a massive 62,000-sq.-ft. boat warehouse in pristine Matheson Hammock, a peaceful, scenic park and natural habitat with biking trails, small-scale marina, and a unique salt-water atoll pool off Miami’s Biscayne Bay. SOMHP’s Website. Click image to enlarge. The County had quietly gone ahead and awarded the building rights for a 5-story boat warehouse at Matheson Hammock Park with no regard for its negative impact on wildlife, the environment, and, the wishes of the area’s nature-loving residents. E-newsletters were also sent out on a weekly basis to a growing list of 8,500 petition signers/subscribers to keep them informed of the latest happenings, with critical links back to the website or to the latest YouTube video of a city hall meeting. 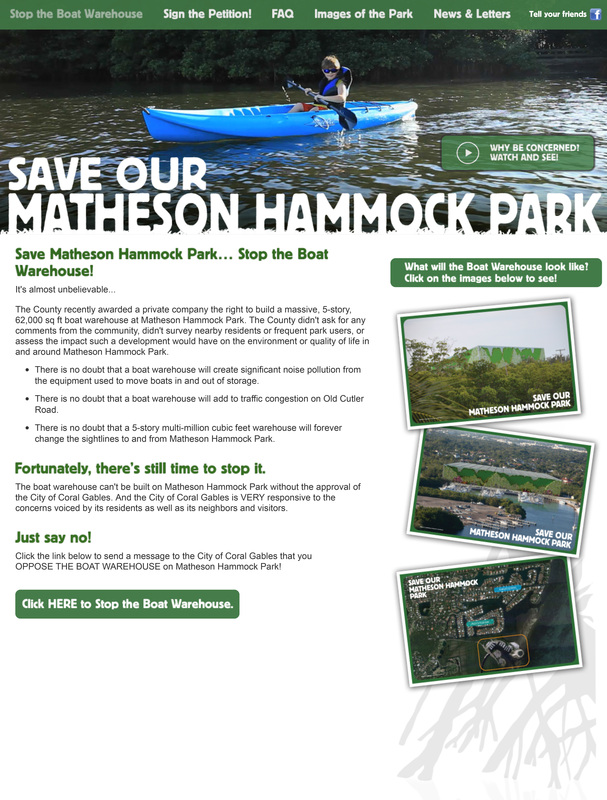 To date, Save Our Matheson Hammock Park website and social media campaign received 1,910 “likes,” over 8,500 petition signatures against the boat warehouse, and recruited eight area communities to rally to our cause. In addition, a Photo Day event was a huge success in raising awareness, when a stalwart band of photographers and “iPhonographers” gathered to show support and post their images of the park under the hashtag #savematheson. The event also garnered media coverage from local news stations.